This day will explore connections and stress. First, we'll examine the way that stress affects and is affected by our relationships with others. Then we'll look at how stress connects to our future through long term effects. Finally, we'll look at the connections between diet, exercise, and stress. 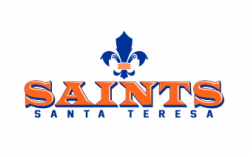 Wear your Santa Teresa gear: sports, club, or other ST Apparel. Bring a partner to the Multipurpose Room and learn some neck and shoulder massage techniques from Ms. Van Der Veen. Knowing that others have our back can really help to relieve stress. Tell a friend or family member that you support them today. What relationships help you with your stress? Give those people a shoutout with the hashtag #HealthyST. - Share rationale: it is easier to recognize the things that stress us out if we notice details about what we are thinking and feeling. if we pay attention to what we are thinking and what is bothering us, without judgement and without acting impulsively, then we can deal with it more effectively. - Give instructions: notice thoughts as if they are floating by on a cloud or moving across a conveyer belt and land in a box to be examined at a later time. No judgements, don't get caught up in the thoughts, notice them without holding onto them and when you become distracted bring yourself back to the next thought.